Some of the greatest support I’ve had as a parent has come from my online birth groups – groups of mums brought together by one great coincidence: all being pregnant and due at the same time. Most of them I’ve never met, many of them I barely know, but I credit them all with getting me through my darkest and toughest days of parenthood – the ones where you’ve barely slept and you’re not sure how you’re going to get through the day. Through them I’ve seen the best in other people – complete strangers coming together to celebrate the good times, and to support each other through hard times. And through their eyes and words I’ve seen the worst in life – the kind that makes you grateful for every ounce you have, and hug your loved ones a little tighter. On Valentine’s Day, when most of us were celebrating hearts full of love, a family from my original birth group with C had their hearts torn apart. A beautiful little girl called Faye, the same age as C, lost her fight to Meningitis. I didn’t know Faye – for reasons I can’t even remember our group split into a few smaller ones when we shifted onto Facebook, and her Mum ended up in another group. But she was one of those I shared pregnancy with, and that makes it feel very close to home. Just a glimpse of the pain her family must be feeling is more than I think I could bear. 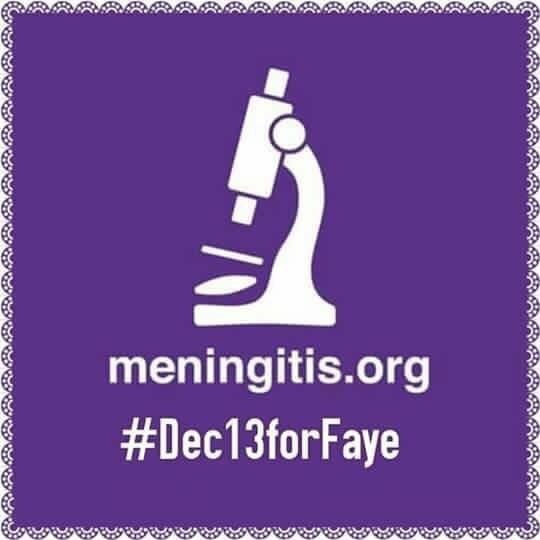 Until Faye, I didn’t know that there was now a vaccine for Meningitis B. With that vaccine, Faye could still have been here. The Men B vaccine, Bexsero, was licensed for use in Europe in January 2013, 11 months before Faye and C were born. In March 2014, when they were 4 months old, the Joint Committee on Vaccination and Immunisation (JCVI) recommended it be introduced to the immunisation schedule. But due to negotiations over price it took until September 2015 to start being given, and then only to children born after that date. There was no catch up programme for older children – for Faye, and for C.
Today, the parents of children born before September 2015 can pay privately for the vaccine, if indeed you can find somewhere with it in stock (there is currently a nationwide shortage), at a cost of upwards of £200. But protection from a preventable killer disease, shouldn’t be based on ability to pay. This petition, asking the government to expand the immunisation programme, has grown from around 500 signatures to over 11,000 in the days since Faye was diagnosed with Meningitis. That’s enough for the government to respond, however not enough to spark a debate in parliament. Without this, they may simply cite the evidence that the peak in Meningitis B infection is at around 5 months, ignoring the fact that it is still a major killer of children up to the age of 5. I have signed, and would ask that you do too. The petition has now reached over 270,000 signatures, which means it will be considered for parliamentary debate. This is fantastic – thank you all for your support! Whilst signing the petition is still inportant, we also need to get MPs on board. Please please please can I now ask you to write to, call, email your local MP to ask for their support for the campaign.